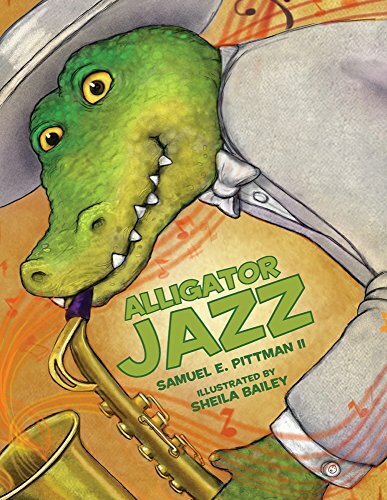 A slight but charming jazz-centered tale, Alligator Jazz tells of musician Alligator Slim’s conversion from blues to jazz. (“I’ve sung the blues slow and I’ve sung the blues fast, but I’m laying down the blues and picking up jazz.”) Abandoning the swamp life, Alligator Slim grabs his sax and hat and heads for the big city. The all-animal city is populated by a wide range of colorful characters, from highbrow storks and bicycling goats, to elegant giraffes and tourist cows. Slim soon lands a gig at the zoo, earning scads of new fans with his sound. This irks jealous Weasel, who steals Slim’s sax and decides to play it himself. Crestfallen, Alligator Slim searches everywhere for his sax, including in a trash can where a rat barbershop quartet is rehearsing, but can’t seem to find his beloved instrument. When he returns to the zoo to catch one more jazz set before going home to the swamp, Alligator Slim witnesses Weasel onstage making a fool of himself with the horn, and decides to show everyone how it’s really done. The book’s strongest point is its delightful illustrations, which create a world that instantly pulls the reader in. Kids will enjoy poring over all the details of this multilayered animal city, with creatures from the savanna to the suburbs all mixing it up together. The art’s color palette, leaning heavily on purples and greens, further supports the cool jazz theme. “Now the city’s my home, and my music is jazz!" And he stayed and he played on that sax with pizzazz! Alligator bought a new suit, a new hat, and cleaned up for that night. “Alligator Slim was in a terrible bind! On the whole, however, Alligator Jazz has enough heart and excellent illustrations to overcome its limitations and carry the day. Jazz lovers in particular will warm to its theme of playing the music you love.